Your business is unique. Your payment needs are too. That's why we developed the Payment Network. The Payment Network is a robust suite of services that enables Software as a Service (SaaS) platforms, Marketplaces, Direct Selling Companies, Software Providers and more to facilitate the movement of money globally between merchants, affiliates, consultants and partners with a single point of integration. The ProPay Payment Network allows platforms complete flexibility in how they fund their sub merchants. ProPay customers who use our network enjoy added flexibility, speed and savings — all through a single point of integration. Creating loyal distributors is a key to growth for any direct selling company and the faster you pay them, in the ways they would like to be paid, creates greater loyalty. For direct selling companies, funds can move from a corporate account to distributor accounts for commissions and bonuses, and from distributor accounts for purchase of product (ProPay SpendBack®). Payments can be split within the network (ProPay SplitPay®). For example, when a purchase is made by a consumer through a distributor, the distributor can be paid their portion of a transaction (retail differential) and corporate can receive the wholesale portion of the sale and ship direct to the consumer. Monetizing the collection and disbursements of payments gives SaaS platforms, Marketplaces, and Software Providers a comprehensive, customizable suite of services that enables the distribution of funds globally between their merchants, affiliates, consultants and partners. For example, take an online ticketing service. 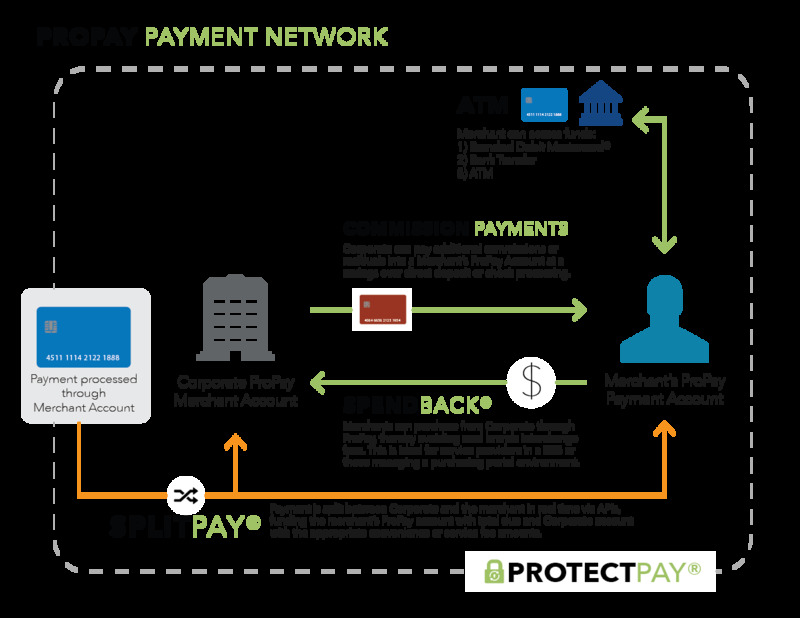 Through the Payment Network's payment splitting functionality (ProPay SplitPay®), the card payment is immediately divided so that the SaaS provider receives a revenue share percentage; the ticketing company - the SaaS provider's merchant - receives a convenience fee; and the entertainment venue receives the remaining portion of the payment. The ticketing company can then disburse to its sales agents via prepaid card, bank account or electronic funds transfer (EFT). The ticketing company can also purchase items from its suppliers (ProPay SpendBack®) and pay less for payment acceptance than typical card processing discount fees. Do you want to split transaction funds into multiple accounts? Do you want to save money on distributor's wholesale orders? PROPAY'S UNIQUE PAYMENT NETWORK FACILITATES UNIQUE SUCCESS. IT'S LIKE HAVING YOUR OWN PAYMENT "INTRANET". THE PROPAY PAYMENT NETWORK CAN SAVE YOU TIME AND INCREASE YOUR BOTTOM LINE. ProPay recognizes that one payment solution does not fit all industries. Experience working with companies in a variety of industries has allowed ProPay to develop specific solutions to meet the unique needs of these businesses. For more information about credit card processing through our Payment Network, call 888.227.9856, email sales@propay.com or fill out the form below. Required form 'PaymentNetworkWeb' does not exist.